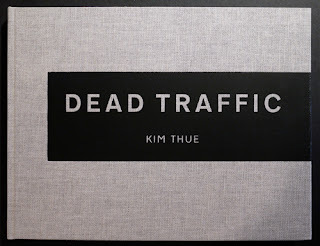 The title of Kim Thue’s new book Dead Traffic conjures up a variety of images. Indeed Thue’s Dead Traffic, modestly wrapped in beige cloth with the title in all caps on the cover, is not a book to be browsed lightly despite the ease with which it resides in the hands. The photos are grainy and gritty and printed on a creamy yellow paper giving them a quality of warmth and age. Thue's photos confront a world where life is not easily lived, but Big Wharf in Freetown, Sierra Leone was like a home away from home for him. Kim Thue, a self-described bald, blue-eyed Dane, was invited to document daily life surrounding a charitable Danish hospital in the capital of this West African city. He found Big Wharf, a small community filled with youth and immersed in a world that faced challenges of crime, prostitution and drugs. Thue’s personality and spirit resonated with these individuals and, striving to reject the cliched Western images of the postcolonial world, he set out to document a different view of the everyday life of Freetown. His photos are mostly portraits—those of people and a few animals. Scars, tattoos and injuries mar their bare flesh. One series of portraits is shown four to a spread, all with the backdrop of a graffiti marked wall. The head tilts and body angles vary, but all sitters stare into the camera. They are all so enticing in their formality. I stopped and explored one photo in the series of a handsome bare chested man and moved over to another of a man with the tattoo of the Anglo-featured woman on his arm, followed by a woman with a floral head scarf, another female donning a Ralph Lauren shirt and finally a woman wearing a rosary that falls around her neck, the cross resting on her bikini top. Many of the other portraits are candid of briefly halted scenes. The portraits are broken up with the occasional interior or street scene, but mostly life in this area is mapped on the faces of its residents.